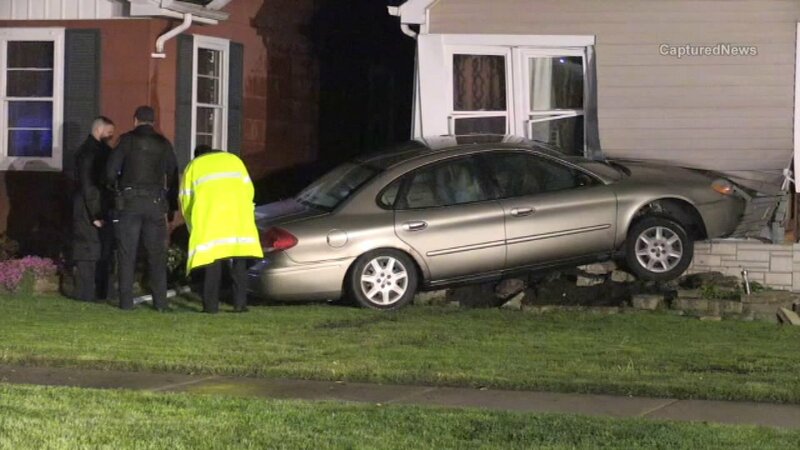 OAK LAWN, Ill. (WLS) -- A driver lost control and plowed into a house in south suburban Oak Lawn Saturday morning. The four-door sedan wound up partially in the house on the 4900-block of West 91st Street. There were people inside the house at the time of the crash and neighbors heart the impact around 2:30 a.m.
"It sounded like a garbage can crashing or something, we didn't know what it was and about 15 minutes later that is when we saw the lights from the fire department showing up and we saw that the car was in the house already. I was concerned that somebody might have been hurt in there because the car was in there pretty deep," said neighbor Chuck Hagen. It is not clear what led to the crash. Neighbors said a small child was among those who were inside the house. Authorities have not said if anyone was injured.